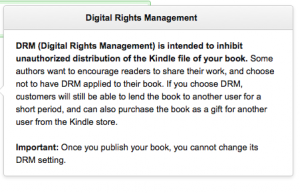 This post is about digital rights management (DRM), why I chose to enable it on my Amazon ebook, why I changed my mind, and most importantly, how I removed it. If you are only interested in the last point, click here. It’s a contentious issue, some people are pro, some are against. You can read more about how DRM applies to ebooks here and here. It’s harder for people to share your work (unlike print books, which are easily shared). If a reader moves off kindle to another e-reader, they can’t take a DRM enabled book with them, and would have to buy it again. If someone really wants to hack your book, it’s an easy thing to do (do an internet search to see what I mean). Once you have it enabled on your book, you can’t get rid of it. I published my first novel at the beginning of Dec 2015 on KDP select. Amazon gives you an option of enabling DRM or not, and their drop down info box reads like this. As you can see, Amazon gives you a little information on what DRM is, but not a whole lot as to the ramifications of having it. Maybe it’s not really in their interest to go into more details. But, in this day and age, if you are capable of publishing a book on Amazon, you should be able to do a little research into DRM. 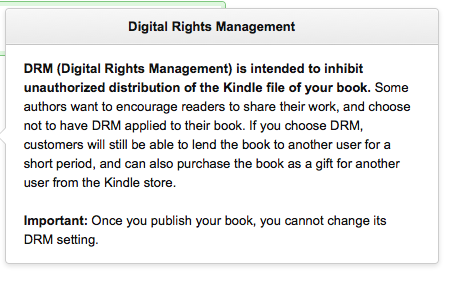 Amazon also clearly states that once you publish your book, you cannot change its DRM setting. As a self-confessed luddite, I was quite pleased that I managed to self-publish, but I didn’t do any research into DRM, and enabled it. I had been so focused on the creation of the book, I hadn’t really thought through the publishing process as well as I could have. Publicity is oxygen to any business. I enabled DRM. A few weeks later, I finally got round to reading David Gaughran’s book Let’s Get Digital. In it he has a chapter devoted to this issue. For me that chapter was worth paying the price of the book alone, and I highly recommend the entire book, especially for new authors. He makes a convincing argument against DRM. e.g. examples of how freely available (and non-DRM) work has improved book sales overall. I won’t attempt to rewrite his chapter here. I also checked out some other sources on the net that I trust, such as Joanna Penn, who doesn’t have it enabled on her work (see here for confirmation and a guest talk on this issue). After realising that I may have made a (rookie) mistake on this matter, I looked to remove the DRM from my book. I couldn’t. The box clearly states permanent. Surely there was a way? After trawling through several contradictory threads on forums, I went back to the source: Amazon. I sent them a polite email, asking how I could remove DRM without losing my reviews. Within hours they had replied. Amazon states that the only way to remove DRM from a book is to unpublish and then republish. You will lose the sales rank of that book. Any reviews you have will be transferred, as long as all of the book details match. Why did I decided to strip it? My book had been on Amazon for less than a month. After a mild flurry of sales when it was launched, it was languishing in the charts (to put it kindly). At one point, I almost emailed Amazon because I thought my report page was broken. It’s not. I just wasn’t selling. There are various reasons behind this (that’s a future post), and I don’t think for a minute that just by having DRM enabled, I was killing my sales. The advantage of the low sales ranking was that I wasn’t really bothered about losing it. (This man expresses it much more eloquently). If I could keep my reviews in the process, then I didn’t have much to lose. Un- and republishing didn’t take long, but I did have a nail biting wait for the reviews to reappear. During this period I emailed Amazon again to confirm that the reviews would reappear. Within hours, once more, I received a reply saying that the editions had been linked and that it would happen, but may take up to 48 hours. Within an hour of that email, all the reviews were there. The whole process, from my first query to Amazon to the new, non-DRM version of my book being published with the old reviews, had taken just under 24 hours. I would like to say that Amazon’s customer/ author support has been exemplary through out this process. This is not something I intend to make a habit of, nor something I would recommend for anyone, especially a more established author with a decent sales ranking. There is also no guarantee that this policy will remain. But, for a rook just cutting his teeth, it was a good solution, and a very good lesson. What frustrates me most is that the information was out there. I bought my copy of Let’s Get Digital months ago, but only got round to reading it recently. If I had stepped back from my drive to publish to do a simple internet search, I wouldn’t have had this problem. There is nothing new under the sun, every mistake has already been made, every excuse already told. But occasionally, just sometimes, permanent can mean temporary.